This isn’t the first time a Grand Theft Auto title was brought down to a handheld scale. We’ve actually already seen GTA on the Game Boy as well as on the Playstation Portable. But the reason GTA Chinatown Wars takes so much notice, isn’t just because it was made smaller, but also because despite the hardware used, Chinatown Wars captures the GTA feel almost perfectly. Here are a few reasons why Chinatown Wars is, although new, very much similar to the console versions of GTA. The perspective is no longer a behind view of our main character, but instead a 360 degrees overhead view. This might be the most significant change in the entire game, but you are still able move around and do pretty much whatever you want like the previous installments. Stealing cars is a trademark in the GTA series. In Chinatown Wars, you can still steal cars, but there is a new system applied here. Different cars may need different ways to steal them. Example, a certain car may need just a screwdriver while another one would require hotwiring. Chinatown Wars has a drug-dealing sub-plot. This is a new feature that allows players to make cash by dealing drugs around the city. You check the demands of certain places and distribute accordingly. This gives Chinatown Wars an underground and dangerous feel. Online play is a huge feature of Chinatown Wars. You are able to go to the Social Club website to share stats and get additional content. Going online also allows you to compete with others, trade items, chatting, and others. Grand Theft Auto: Chinatown Wars is a monster of a game in a small handheld system. Even at its small state, it offers just as much as any GTA you’ve ever played before. 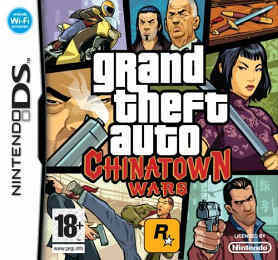 Chinatown Wars is a true masterpiece for the Nintendo DS.